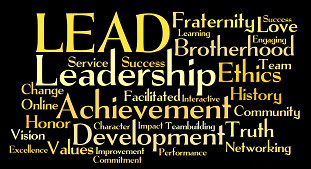 Sigma Nu LEAD - Sigma Nu Fraternity, Inc.
LEAD is Sigma Nu's award-winning ethical leadership development program. In alignment with Sigma Nu's continuing efforts "To develop ethical leaders..." we offer the LEAD Program as a tool to assist our membership in both gaining the knowledge and developing the skills and abilities needed to be an effective and ethical leader for life. The LEAD Program is a comprehensive ethical leadership development program designed to ensure participants "learn by doing." We encourage all our collegiate chapters to utilize the LEAD Program to the fullest extent possible. This section is a compilation of all the information and resources needed to fully implement our LEAD Program. Whether you are a LEAD Committee member looking for facilitator notes, a collegiate member with a specific question about a specific session, a guest facilitator looking for session materials, or a parent just looking to become more involved with the Fraternity, this is a great place to start. The LEAD Program is an interactive experience designed to meet the unique needs and learning styles of our collegiate members by focusing on in-person facilitated workshops on topics relevant to their year in school and experience in the chapter, campus, and community. An online resource library of supplemental and resource material for participants to learn more about each session's topic - before or after the session - is now available. Phase I, II, and III participant content is live now, with Phase IV coming soon. Guidance notes for the facilitated portion of each Phase and session are provided in the facilitator manuals available on the following pages. A new tracking system and Sigma Nu Transcript that records member participation and completion of LEAD sessions and phases; includes a new certificate program to award education and training in the areas of Leadership, Ethics, Achievement, and Development; tracks attendance at Fraternity events, academic performance, and Sigma Nu leadership experiences (e.g. officer and committee roles); provides a co-curricular Sigma Nu & LEAD Transcript that members can use to track their Sigma Nu experience, helps them write their resumes and cover letters, and assists them in describing the skills, experiences, and achievements resulting from their Fraternity membership for job interviews.